OK…I’m back. I know some of y’all thought I was M.I.A. but I one of my resolutions is to unplug sometimes…anywhoo. Mario is back on the scene in a new anti-fur ad for the animal rights group PETA. 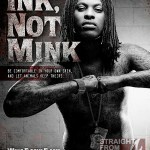 His new slogan is “Ink not Mink”…so apparently Mario wants you to scar up your bodies instead of rocking fur & leather. Next time I see him, I swear umma be checkin his footwork. There’s no way this knee-grow rocks all canvas kicks… NEXT!